Government officials joined hands with FIU to bolster the spirits of those affected by Hurricane Irma and to throw their support behind the university’s efforts to meet ongoing needs. In the days following the storm, President Mark B. Rosenberg welcomed national, state and local representatives in a show of solidarity with evacuees, first responders and the people of South Florida in general. They toured the shelters on campus and gathered with students and employees volunteering there under the direction of the United States Public Health Service, the State of Florida Department of Health, the Monroe County Public Health Department and the American Red Cross. 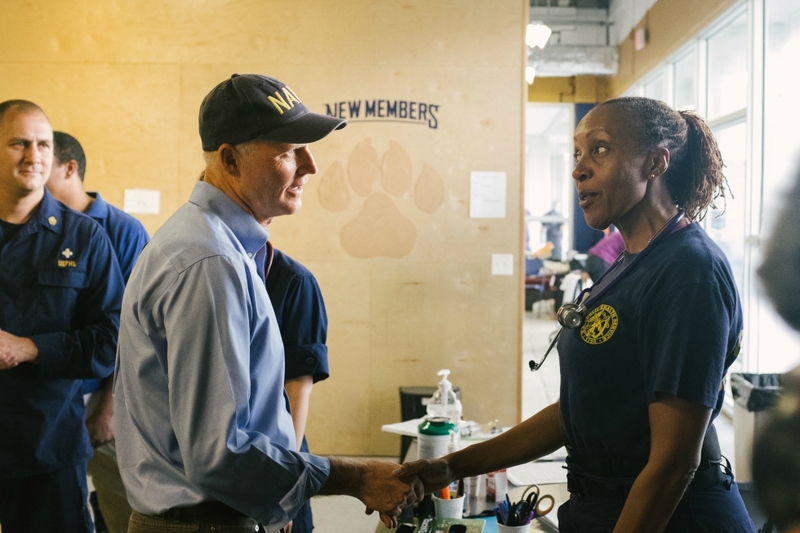 And they met with FIU’s emergency operations team to hear directly from those who secured the campuses and coordinated the university’s planning-and-response activities throughout the storm. Among the visitors were Gov. Rick Scott and Lt. Gov. Carlos Lopez-Cantera; U.S. Secretary of Labor Alexander Acosta; U.S. Rep. Carlos Curbelo; state Sen. Oscar Braynon; and state Reps. Jeanette Núñez, Jose Felix Diaz and Daniel Perez. The activities undertaken by individuals and their of ces included restocking the FIU student pantries, supplying and serving meals, and providing a special wheelchair for an evacuee, among others. Pictured above: Following Hurricane Irma, Gov. Rick Scott meets with members of the U.S. Public Health Service to discuss the status of a special-needs shelter set up in PG-6.